Local arts leaders look to balance the river-rafting hub's lifestyle, natural beauty and other lures to newcomers with the rising cost of living and other consequences of rapid growth. In south-central Colorado, Salida has a kind of beauty that borders on the ostentatious. It's surrounded on three sides by spectacular mountains -- the Sawatch Range to the north and west; the Sangre de Cristos to the south. The Arkansas River flows through the city center, flanked by a verdant riverfront and draped by ancient oak trees. In the charming downtown, the largest historic district in the state, former brothels and newspaper offices are now vibrant breweries, restaurants and shops; some still have swinging saloon doors. The residential area is flat grid of Victorian houses and gardens, each block bucolic and almost too cute to be real. Yet Salida's soul is best revealed in small, subtle details. The town rewards curious, close observation with delight. Scan the sides of buildings from sidewalk to roof and you're likely to discover a hidden piece of stencil art, or a window box spilling over with flowers. Look down: There are poems engraved in the concrete. Stop for a moment in an alleyway and you'll probably be greeted by somebody's cat. The town feels not just lived in but loved. Curated. 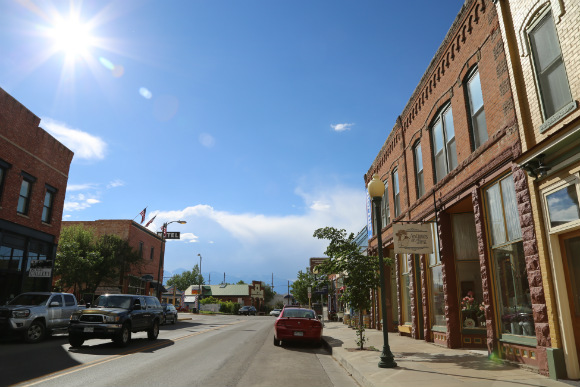 Salida sits 140 miles from Denver, nestled in the shadows of the Collegiate Peaks just north of the San Luis Valley. 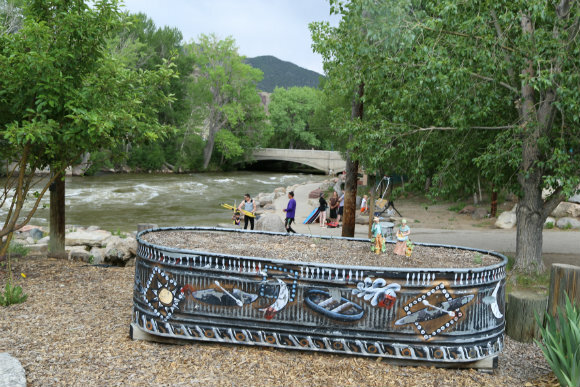 It's been long known as the center of Colorado's whitewater rafting universe, but it's increasingly known for its vibrant arts scene. There's attention to detail in unexpected corners of Salida. In 2012, the Salida Creative District was designated a Colorado Certified Creative District, one of two areas so designated as flagships in a statewide initiative designed to recognize and monetize the work of creative people -- not just painters and potters but designers, craft brewers, muralists, artisanal cheesemakers -- and to track their impact on the state and regional economy. (The other was the Art District on Santa Fe in Denver.) Colorado Creative Industries (CCI) recently named six new creative districts, bringing the total statewide to 18. And in that context, certification was a big deal for Salida. Michael Varnum, program manager for the Salida Creative District, says it made for "instant credibility" in Denver and the Front Range. 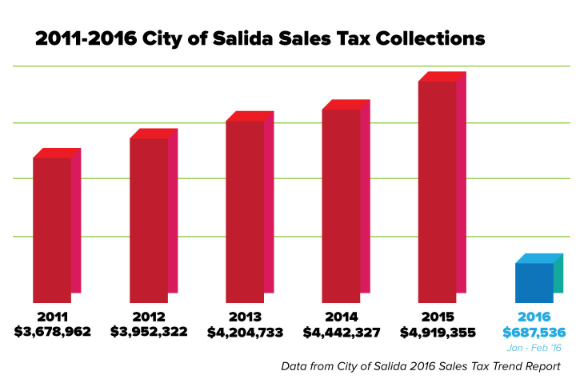 Sales and lodging taxes are up, vacancies in the district's storefronts are down and Salida's arts leaders have leveraged CCI's professional network to great effect. In Colorado, the creative industries are one of the fastest growing sectors in a state that's booming. They're increasingly seen as an economic offset as as traditional economic drivers -- like mining and ranching -- decline, especially in rural areas. 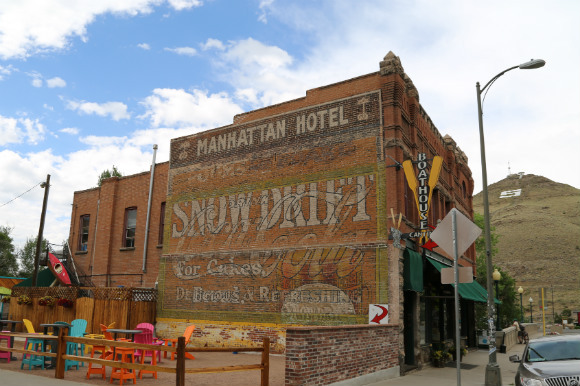 Arts and culture in Salida, a former railroad town, generate a small but mighty chunk of the estimated 200,000 jobs generated by creative industries in Colorado each year. An index of the city's creative workers includes welders, blacksmiths, musicians, filmmakers, distillers and brewers, photographers, writers and many others. Downtown, once-empty buildings now house galleries, arts supply shops and co-op marketplaces. On U.S. Highway 50, commercial space for rent has become hard to come by, as new restaurants, breweries and wilderness outfitters move in or expand. After outdoor recreation, the arts are the town's biggest tourist draw. 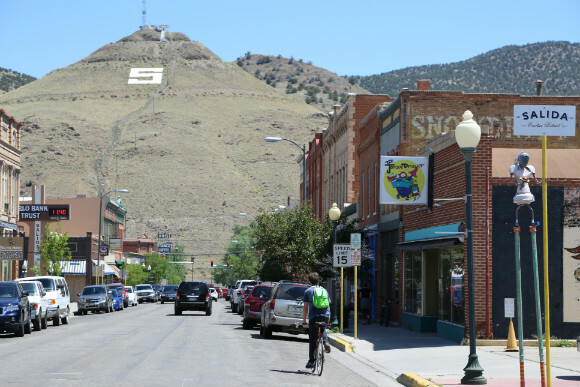 "S" Mountain rises above downtown Salida. "Hiking, biking, rafting, kayaking and skiing are huge draws to Salida, but the diverse stores, galleries, restaurants and avenues for entertainment give visitors a reason to stay longer," says Lisa Marvel, owner of The Book Haven retail store and president of the volunteer-led Salida Council for the Arts, which formed in 2002. "Salida has become a destination spot, so artists can enjoy financial gain from increased tourism. But it's a real town, not a resort." "The local city administrators are open to ideas and support the local artist efforts," says Larry Payne, who serves as the Council's vice president. "There have been a number of historic buildings renovated and turned into showing galleries for local artists. We now have a public arts task force [formed in 2014] to review and fund public art throughout the city." One of those historic buildings, the Salida SteamPlant, opened as a cultural and performing arts center in 1989. The 1887 steam power plant is now booked year-round by local and out-of-town groups. A summer concert series by Colorado Symphony ensembles regularly sells out. 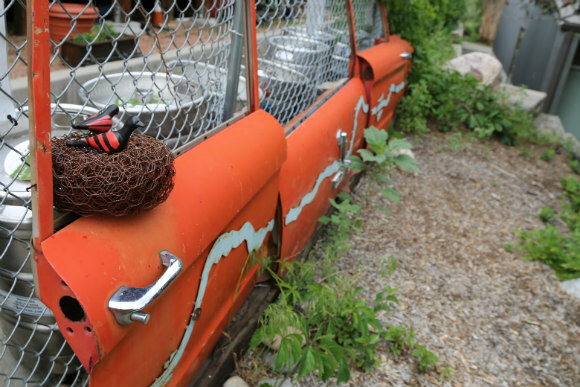 The SteamPlant's sculpture garden features works made from reclaimed materials, stones and metal. It's edgy, challenging, with nary a bronze buffalo in sight, and it's one of Salida's most popular spots. 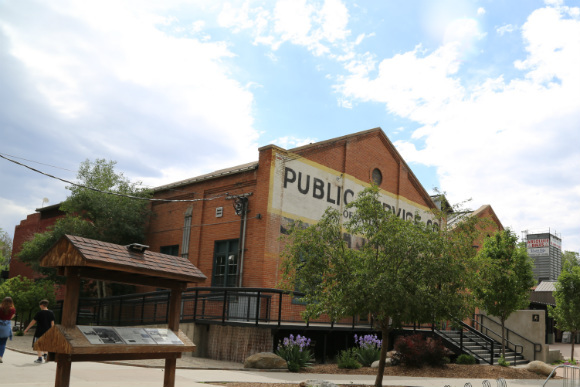 The Salida SteamPlant Event Center is a shining example of adaptive reuse. On a Saturday night in June, after a brief but torrential burst of rain, Terri Dunn and Greg Walter sit in the entrance to wanderLust road, their boutique and resale clothing store on one of Salida's major commercial drags. They drink red wine, chat with people who pass by -- both popular pastimes in Salida. Dunn and Walter met and married in Salida; they bought the building that houses their shop, a turn-of-the-century storefront and former bar, in 2011. They lived in the back for two years as they built their inventory and their business. "Salida is a great place for artists to do their own thing," says Dunn, a native of Chicago who lived in Denver before moving to Salida. Business is good, she says, especially in the summer, when events like FIBArk, one of the oldest and largest kayaking events in the United States, and the Colorado Brewers Rendezvous bring thousands of visitors to town. In the offseason, things slow down. In Salida, as in many small towns, it's helpful, even necessary, to have multiple sources of income. Lots of artists, Dunn says, work multiple jobs or commute to Denver for gigs. The Salida Business Incubator, located in the basement of a gallery-filled building, helps local entrepreneurs develop viable business models, to help weather the season uncertainty of life in a small mountain town. Salida is home to Colorado's largest historic district. 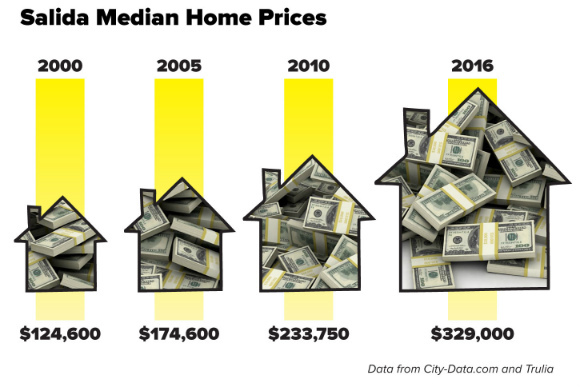 Salida is still relatively affordable, at least by modern Denver standards. The average home sells for about $300,000. But costs are rising, as is the population (which is rebounding from a decline in the early 2000s), which currently hovers at about 6,500, many of them retirees. 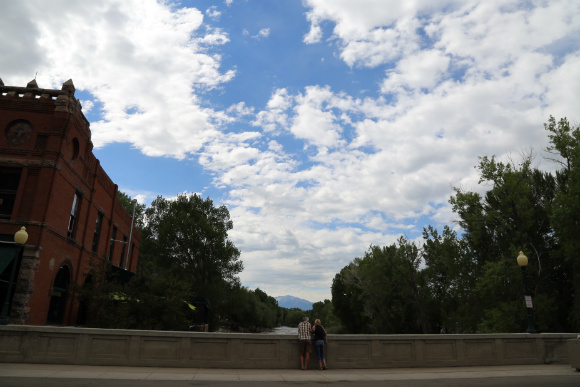 Change in Salida, as everywhere in Colorado, has brought opportunity, a little bit of diversity (Salida is overwhelmingly white, though some creative folks of color have moved in in recent years) and some tension. New developments in town have been controversial, including the construction of several modern, upscale mixed-use residential buildings; one will be located on the site that formerly housed The Crib, a storied former "female boarding house" that closed in the early '50s. "The community here is pretty close," says Dunn. "We get kind of protective when new people move in. Like, 'Are you good? Are you going to change things?' We're, like, guardians. We usually wind up warming up. But there is a feeling here, with new buildings coming in, that we have to be careful." The Arkansas River is one of the top whitewater destinations in the U.S. The word about Salida is out -- and people are going to keep coming. Larry Payne says Salida needs to keep artists in mind as the town continues to grow. "There has been significant family and retiree influx despite the rising costs of living in a small community," he says. "An increase in out-of-state owner investment for the purpose of VRBO has driven the cost of living considerably higher, which has, in some cases, forced other long-term renters to leave the area because of rising costs." Payne would like to see a commitment to more inclusive development. "I'd like to see more affordable housing for lower-income families so they may remain in the area, that includes local artists who are sometimes pressed by the economy," he says. Artist Jessica Vogel opened the Art and Salvage Gallery on F Street seven years ago. As Salida's reputation as an arts community has grown, so has her business. She used to close shop to travel during the fall and winter months. Now she stays open year-round. "As a business owner, I've noticed an increase in the number of art lovers visiting from other places. In my opinion, the timing of the initial designation as a creative district corresponded with that increase," she says. "People come for the beauty, art and outdoor activities. They stay in our quaint hotels and dine in our awesome restaurants. "It's fun to watch people fall in love with the town," Vogel adds. "It's exciting to watch friends open successful restaurants and stores, to see other friends in the construction business stay busy. To watch artists succeed and new ideas for the town come to fruition. Like anyone, I worry about too much, too fast, or housing prices pushing people out. But I think it will all work out fine and the dust will settle." Pat Landreth and his wife, Suzanne Montano, have put Salida's appetite for the bizarre to the test. 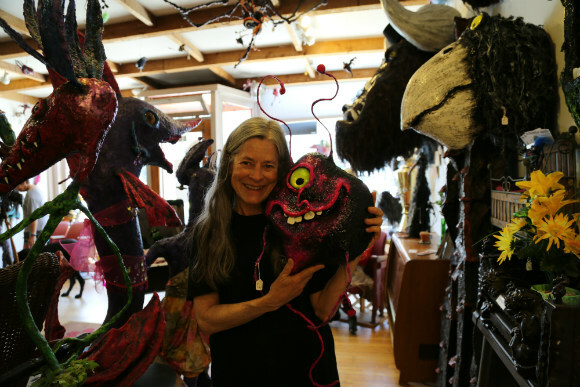 When they moved to town from Fort Collins in 2001 with their handmade "monsters" -- colorful, sculpted creatures that evoke demented but friendly Fraggles -- they were instantly embraced. 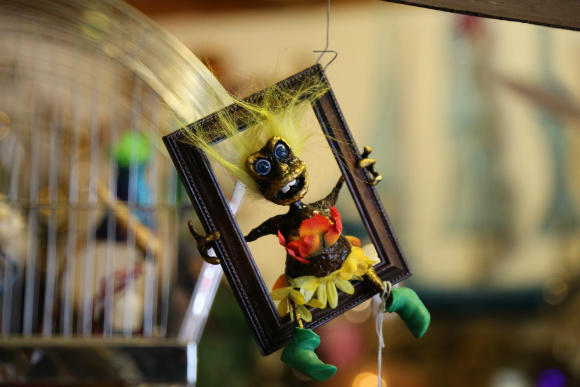 Nearly 15 years later, their store, Bungled Jungle, is a menagerie of "beautiful garbage," as Landreth affectionately calls it, and a Salida staple that evokes Tim Burton films, and dreams from childhood and a world as yet unnamed. Also on display (and on offer) are Landreth's steampunk machines, assemblages of old clock faces, levers, dials from vintage scientific instruments and other odds that he combines to make magic. Works like The Miasma Disperser and the Thought Scale are at once fantastical and familiar, kind of like Landreth himself. Confluence Denver: You travel around the country, selling your work at shows. What keeps you in Salida? Pat Landreth: When we first came to town, we were immediately struck by how unpretentious it was. Artists in Salida are, for a change, not a persecuted minority. There was an incredible feel here. When we did our first show here, a Christmas show, we expected to sell one or two pieces. We sold more than half. It was very unusual. CD: What is it about Salida that most appeals to artists? PL: I think it's easy to feel immediately at home here, which is something I've seldom felt in small towns. There's a feeling of 'live and let live.' And there's a little more energy coming in every year, but it's still off the beaten path. CD: You can make a living off of art, here? PL: This is not a wealthy community. Things are still pretty affordable. You have to supplement especially in winter. Otherwise you can't survive. We're not near a ski slope, which is part of what saves us from having big money comes in. Because, as we all know, when big money comes in, all of the artists have to move out. CD: When you and Suzanne met, you discovered you both made monsters. PL: I started doing what I was doing when I was five years old. I was a nuclear physicist, I taught at the University of Washington, in the Vietnam era. Suzanne was a geologist, but she made these weird things, too. Now, we're collaborators. Sometimes, a monster is 90 percent me. Sometimes, it's 90 percent her. We love working together, because with two people you get the creativity of three.